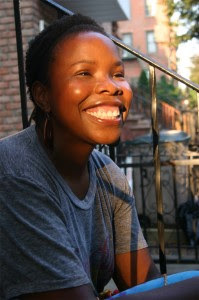 I'm delighted to welcome the author of one of my favorite recent reads, 8TH GRADE SUPERZERO, Olugbemisola Rhuday-Perkovich, better known in the kidlitosphere as Gbemi. Pour yourself a cup of tea and join us as we find out more about the author (who is lighting up the Fire Escape with her beautiful smile, no?) and her funny, inspiring middle-grade book featuring an unforgettable guy protagonist. Describe Gbemi at age fourteen. Yikes! Trying to set a record for number of after-school activities. Obsessed with "A+"s. Tired of people suggesting that she change her name to something easier when she gets older. Certain she'd be a playwright and live in a very modern Central Park West apartment with lots of windows and stainless steel appliances. Lots of rubber bracelets, large and mismatched earrings, off-the-shoulder fashion, mini skirts and patterned tights. Enthusiastic participant in lip-sync competitions, and secret member of the math and debate teams. Voracious reader and painfully earnest journal-writer who desperately wished someone would know that she was a 'true princess', and a dreamer who was never quite able to mask just how out of place she felt. I can just picture you, Gbemi. We would have been friends for sure. Okay, now about the book. What was the biggest (hardest) change you made in response to Cheryl Klein's editorial input? Cheryl is such a gifted editor, and it was wonderful to work with someone who has such a passion for her work. She really understands story structure, and that focus really worked well for a character-driven story like mine, and we spent a lot of time moving chapters around to keep Reggie's story moving. In general, I learned a lot about the importance of getting out of the way of my own work in the revision process. You can fall in love with a line, a passage, a character, and you want the world to know just how clever you are, what literary heights you can achieve (and by 'you', I mean me). I worried a lot about how I would be perceived, what image this book would project. There was a 'deep breath' moment in revising when I had to ask myself if I wanted to use Reggie and the other characters to tell my story, or if I wanted to listen and work faithfully to tell theirs. Reggie was not an easy character to write. It took me a long time to love him; I spent a lot of time thinking variations of 'what a whiner/punk/irritant' this kid is! I can't believe him!' as I wrote. It was important for me to go back and re-discover his lovable moments, his positive qualities and revise with those things in mind, to add dimension and depth. I can't write without really loving my MC—I may not like them sometimes, and they may do, say, and think things that make me crazy, but they're like family, and I have to love them and want to wade through their lives with them in order to make a story work. I absolutely loved Reggie, so I don't want to hear any criticism about him, Ms. Gbemi. I admired his commitment to church and to social justice—both of these are rare in fiction for kids, but very much a part of the lives of many young people I know. Any tips or suggestions for other YA/MG authors when it comes to the expression of faith in fiction? Madeleine L'Engle wrote once that everything an artist does is her witness, we cannot hide what we are. And I think that's true. Whatever you believe, whoever you are will come out in your work. I think it's important to be true to the story—to put the storytelling first, and to be honest. Don't write what you think you *should* write because then false notes are inevitable, I think. Trust, and be willing to take risks, and make mistakes. Remember that it's not only, or even mostly, about you. And if you're a praying sort of person, pray in all of its wonderful forms. Amen, sister. I'm certain that future writers are going to be quoting *your* pithy remarks in tweets and status updates. Besides Reggie, one of my other favorite things about 8th GRADE SUPERHERO was a great sense of place. What's your connection to the community you describe in Brooklyn? I've lived in this part of Brooklyn for almost 13 years, and had been wishing I could live there for about 6 years before that! It is a place where I do feel that I can be most myself without worrying if I'm too much of this or too little of that, where I don't *have* to fit in. It is a wonderfully alive and complex cluster of communities, and what I most enjoy is it's genuine diversity, something that I think is becoming more and more rare in today's America. Gentrification, urban planning, etc. mean that it's by no means always a comfortable diversity, but we are compelled to see each other in different ways and many contexts, and I'm grateful for that. I'm glad that my daughter can see people of all ages, differently-abled adults and children working and playing, hijabs, geles, yarmulkes, Sikh turbans ...that we can easily buy falafel, pierogi and gari. I'm also aware that it's easy to fall into a trap in a community like this, where you verbally celebrate the 'diversity' while treating each other as though we're all museum exhibits, behind those glass walls—not really engaging with each other. So there's a lot of opportunity here, I have to remind myself to be active and take it. Sounds like Berkeley. I'm coming to visit for sure. I hear you, though—sometimes my job title feels like "author and museum exhibit," but authentic engagement is a great balm. Okay, now I want you to finish the sentence twice, first from an idealistic "literature changes lives" point of view and then give the savvy marketer's take. ... first and foremost, that a reader enjoys it, that someone thinks about the book in relation to their own lives, connects with it in some way that helps them think or work through whatever they're thinking about or going through. My own teen years were some of the richest for me as a reader, I got so many gifts that I'd love to give that back in some way. Books were a place of respite for me during a tough time; they gave me a space to work out who I was, even try on different identities at times. My teen reading years were also a period when I learned to read critically. I hope that a reader connects with the idea that there are many different kinds of 'heroes', many ways to be an activist—the small things they do matter, and not everything that we say, do, and think needs to be for public consumption or for some sort of recognition. And there is always room for mercy, redemption, and growth. And maybe they read it again. And maybe they write something of their own. ... a line of Ruthie's knit hats (a related contest coming up!) in a store near you, a syndicated Superzero TV show and a chocolate-flavoured breakfast cereal that is simultaneously really sweet and super-healthy. Sign me up for a hat or two—great gift for librarians, eh? Love the British spelling of "flavour!" What's next for Gbemi in the realm of children's books? More writing that I hope gets published! But more writing, whatever happens. I am working on a YA manuscript about a girl who says to her brother "I wish you were dead" in an argument; he is killed that day. It's an exploration of guilt and grieving, and forgiveness. They all sound fabulous. Just keep writing. We're eagerly waiting for any and all of the stories you will share. Congratulations on the book and the great reviews and buzz. I'm talking about it anywhere and everywhere with a five-star Fire Escape salute! A review from award-winning author Tanita S. Davis. A new Q & A online, and a Twitter chat transcript between Gbemi and Scholastic editor Cheryl Klein. An interview by Ari over at Reading in Color. Superzero is one of the Best Books of the Month (Best Middle Grade Novel) at Amazon.com. Order the book RIGHT NOW from your local independent bookseller.